The Fellowship was fortunate enough to obtain a copy of ARCHIE #1 from Archie Comics. The story is by Mark Waid, with art by Fiona Staples. Archie Andrews and Betty Cooper are the talk of Riverdale High. The couple (who’ve known each other since kids) have broken up since the “lipstick incident.” Everyone wants to know about this incident, but no one is talking. A plan is hatched to stuff the ballot box to get our couple elected Homecoming King and Queen. Jughead, who doesn’t to be involved in any of this, comes up with his own plan. An unexpected event forces Archie to sit in with the band to play lead guitar. Will we have a happy ending? And what is this about the millionaire Mr. Lodge moving his family (including his daughter Veronica) to Riverdale? Also included is a reprint of the very first Archie story from 1941. I am a fan of these characters, so I was a little unsure how I would feel about this reboot. However, I am also a fan of Mark Waid and Fiona Staples so that helped me keep an open mind. Believe me, they delivered. Waid’s script updated the characters without damaging what made them last for so many years. Staples’ art brings freshness to the gang and Riverdale in general, yet keeps the hometown vibe there. I’m onboard with this new take and suggest that everyone should try the book. You are in for a pleasant surprise. 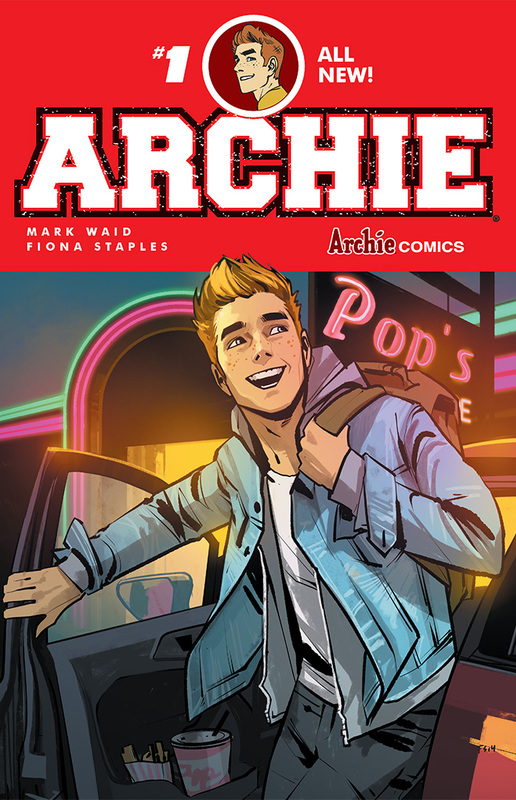 ARCHIE #1 is in stores now, or available for ordering at archiecomics.com.